Nature holds wisdom and healing for us all. Many of us yearn to be more deeply connected to that wisdom ~ to live in rhythm with the moon and sun, her seasons, even her weather. We’d like to know the plants, birds and animals as friends and allies ~ ones we can turn to for connection and for help. Our mission is to help families to reconnect to the healing and wisdom of nature in simple and manageable ways. Hello! 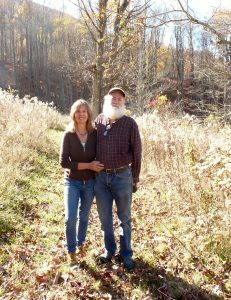 We are Harry LeBlanc and Deb Vail, hosts and co-founders of Grandparents of the Forest. We met at a homeschooling gathering. Harry brought his daughter to a playdate looking for new friends for her and Deb brought her two youngest daughters along with their new pup. Harry noticed the girls were struggling to get water for their thirsty puppy. Without a word, he brought a bowl of water for the hot puppy. That was enough for Deb’s children to know Harry was the right addition to their lives, and they began placing his handwritten business card in locations Deb could not miss around their house. The rest is history. market. After seven years of expanding the farm and the kind of introspection that naturally occurs when one is outdoors almost every day of the year ~ in rain, wind, sun and snow ~ watching the birds and coming to know them as friends, observing the plants and insects of the farm (and sometimes battling some of them) ~ we came to observe more and more miracles of nature. We began studying herbs and realized that many of the so-called ‘weeds’ on our farm had medicinal and nutritional value that was equal to or beyond the cultivated varieties of vegetables we were growing. We came to see the flowers we were putting into our bouquets were not just beautiful, but also medicines ~ and not just for the psyche. As we opened up to our environment, the plants responded to us. Plants that we needed for our own healing seemed to magically appear in the fields where we often tread. 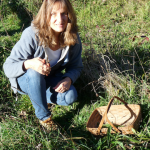 Our study of herbalism expanded and we walked deeper and deeper into a world of abundance and nurturing of which we had only intuited but not fully understood. In the last year at our farm we realized it did not sustain us in the physical, fiscal and spiritual manner we had hoped. So we sold the property and moved to the northwest North Carolina mountains where we could be in a more wild area. 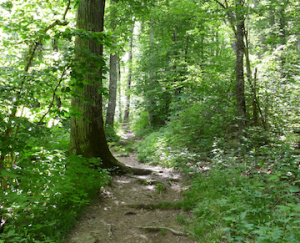 Our new home near the Blue Ridge Parkway allows us to study and develop an even closer relationship with Nature. We began making our own plant-based medicines. We came to know the land around our home as a very generous healing friend and mentor. After only a couple years of this intensive quiet time, there was a stirring inside of us. 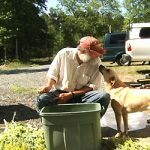 Between seeing the rising unrest in the world and the degradation of Nature, we knew we wanted to help ~ beyond living a peaceful life and tending to our own property and health. During this time, Deb started dreaming about bears on the sid e of our mountain. She would wake with messages from them about humans’ relationship with Nature as well as medicinal attributes of the plants surrounding us. Joined with Harry’s extensive science background, we knew that we had much to share. One day, while walking in the ancient Appalachian forest, we decided it was time to give birth to Nicolas and Elia Graybear ~ two bears from Deb’s dreams who we hope will add playful voices to our message and service. Through Grandparents of the Forest, we seek to share the animist and herbal knowledge, wisdom and medicine from our Sacred Forest ~ which we have acquired through intensive long-term study, deep reflection and intuition. Get to know Harry better here and Deb here. And if you’d like a version of our stories to read to your children, you’ll find it here. We designed and offer this website and our services for both you and your children. Throughout this website and in our workbooks we will, at times, use the voices of Nicolas and Elia. This is a signal to you, dear parent, to share these parts with your children. We hope Grandparents of the Forest can help children, parents and grandparents acquire the skills and knowledge to become Elders of the Natural World who reestablish the vital connection to Nature. This link is vital ~ so humans, bears, elk, turtles, lady slippers, rabbits, oaks, everything – even those annoying skunks… can thrive – each in our own way. Hand-in-paw, let’s go exploring and learning ~ life is a miracle! Nicolas and Elia are waiting in the Sacred Forest, ready to share their wonder of Living Nature. Here are our offerings. A portion of all Grandparents of the Forest’s profits go to supporting Wild Earth, a 501(c)3 non-profit, founded in 2004 and based in New Paltz, NY. Wild Earth offers profound and timeless experiences that help children grow in confidence and self-reliance within Nature. They are deeply committed to bring Wild Earth to underserved youth in urban areas. As we all join hands and return to the arms of Nature, we face a bright future!